The Brunswick Rhino bowling balls balance control and power and don't react extremely to dry or oily areas on the lanes. These factors make this ball great for an entry level bowler or any bowler who isn't looking for a big hooking ball. Brunswick achieves this reaction by combining the R-16 reactive coverstock with their Light Bulb core. Just got back into bowling with my spouse and wanted to have my own ball. This is the purchase I made with pre-drilled holes which I determined a measurement to do from another on line web site and the holes were drilled perfectly for my hand size (X-Large). Bowling.com placement of order is next day typically and I had this ball by the end of the week and was bowling with it that weekend. Absolutely phenomenal speed of placing the order and shipping and notifying by email waht is going on. I highly recommend this company. Thanks! This is my review of the New Entry Level Brunswick Rhino. I selectd the Black/Silver . What I was looking for in this ball was a ball that can get me more right than I have been instead of spotting 17 out to 10 . What I got was just what I was looking for. The New Rhino got me lined up on20 with my left foot and playing straighter than I ever have before. I can play 8 or 9 and get the ball down the lane longer than and a little sharper break down lane. This ball gave me the down lane movement without over reacting. This is going to be an excellent ball for me when the lane breks down later in the session. This will give me the control on shorter patterns also. I will recommend the New Rhino is you are looking for a ball that is controllable and predictable as you move right and play the outside lines. The opinions expressed are solely those of the writer and not Brunswick Bowling . The Rhino is a strong and smooth entry level ball from Brunswick. It is a great value and hooks a bit more than you would expect. It is a little longer than the Strike King it replaces and a bit more angular at the breakpoint. I plan to use this ball when my benchmark balls, like the Danger Zone, are hooking too much. When comparing it to the Danger zone it is about a 5 and 3 move right on the lane with my feet. The Rhino also hooks a few feet later. I believe it will see a good bit of use later in tournament blocks and when I need to start out playing right in the drier part of the lane during league. If your looking for a great performance for a good value I recommend checking out the new Rhino. If your new to the sport of bowling this is a awesome place to begin. This ball is perfect for THS during leagues or practice. The ball is a pearl which helps on the back half of the lane to create some backend . The Rhino is a perfect fit for my bag. It has everything I need when I ball down. This is my second review on this ball now that I have used it three times. I have just started bowling again and this was my first personal ball ever. This ball gets down the lane smoothly and pops with good power on the pins. I have noticed as I bowl more I am getting really good straight control with this ball to go where I would like it to go, providing I line up right of course. I have since purchased another ball from bowling.com and I use this one for my 2nd roll to pick up spares more frequently due to having this straighter control. Highly recommend this ball if you are starting into bowling or starting again. I don't know if this ball was drilled correctly or not. What I do know is that I'm not getting the reaction that the specs say that I'm supposed to get. This ball hooks so bad its ridiculous. I have to stand almost in front of left-hand channel, swing it out between center & third arrow & it still comes back screaming. There is nothing long length, late hook, slight hook or low flare about it. Its violent, I through my money away. are they coming out with new rhino. Hello Ralph! 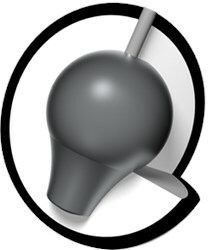 Yes, Brunswick has five new rhino bowling balls that are on pre-order and will be shipped out on May 10th. I am 67 yrs. i roll my ball 15mph. RH Im using grandson balls I use 4step aproach trying to change to 5or 6 Iuse a brunswick ball know like it but want one of my own would rhino be good choice for me or another. This Rhino could be a great option for you. The reaction is not going to be overly aggressive but gives a decent hook on your average house bowling conditions and is versatile enough for you to use one ball most of the night. I'm recovering from a stroke from 1 year ago. Therefore, I'm bowling with 12 lb equipment. Does the Rhino use the same weight block design for all weights? Hello Yendor! No, the weight block will be a more generic, light bulb shape when you move down below 14 pounds. Hello Gab! It depends a lot on what weight you're ordering and where we would be shipping. If you'd like, you can give us a call and someone here can give you a little bit better idea. In general, it will take between 1 and 7 business days. I am 81 yrs young, and started bowling again 3or4 months ago. Back when I did bowl, more than 50 yrs earlier, no one used a hook ball. I'm determined to learn it, but not having much luck with my urethane ball. Would this ball be a good "next step" for me? Hi Tom. That would be hard for us to determine. Please give us a call at customer service and we will be able to better assist you. The number for customer service is 1-800-441-2695. Is this a good entry ball for a two handed bowler? 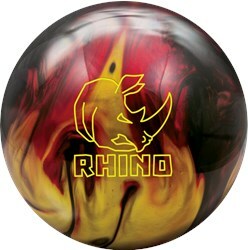 Due to the time it takes to produce the Brunswick Rhino Red/Black/Gold Pearl ball it will ship in immediately. We cannot ship this ball outside the United States.